As a company, we want to do a lot of different things. More specifically—awesome things that our customers really want. That is what we've provided this community for, and so far it has driven requested features like Hairpin NAT, reboot from app, device blocking, device activity, eero connection strength, placement guides, health checks, and many parental control features within Family Profiles and eero Plus. This feature, given the interest and value it adds, is important to us. There are a lot of pieces involved, and most importantly, it needs to be accurate and scalable. But your feedback has been heard, and the right folks across the organization are thinking about it. Thanks again, everyone. We appreciate your ongoing patience and feedback. I bought my eero 2-pack about a month ago. I used PeakHour3 on my Mac mini to monitor my previous router's (AirPort Extreme) total bandwidth. That software doesn't work with eero. I'd love to see a bandwidth monitor feature also. We are excited to hear more feedback on other types of data, specifically regarding bandwidth, customers will be looking for! Jeff C. Looking at the screen shot you posted awhile ago, it shows "% of network activity" has that been removed in the 2.0 iOS app, or am I missing something? +1 to the total bandwidth that is being used across the network at any given time, plus total daily/weekly, or at least once a month tracking would be helpful. Jeff C. Just to be clear, while bandwidth statistics on individual devices is good, I'm hoping for a tool that allows me to see monthly totals for the entire network. My ISP caps my monthly data at 1TB before I incur additional costs. The software I used with my old AirPort Extreme monitored this usage and would alert me if I got close to the limit. It would be great to have a tool like that for monitoring data usage on my eero network. I agree. Just like the firewall that stealths the network, a traffic monitor which tracks data usage over the internet is standard on all routers now except for Eero. And neither one is resource intensive for the routers, but both are vital for network admins and end users, for security and to make sure we don't go over the data caps imposed by our ISP's. I'd love to have both incorporated into Eero. Richard1864 yeah but my experience w netgear in the past is thah they are about as accurate as Comcast's estimates. Jeff C. Any idea when we will start to see this in our app? The feature of current bandwidth activity in the app will be available in an upcoming release. We don't have a date to share at this time, but stay tuned. As for what data will be displayed, at this time, the plan is for app to show the current (live) activity. However, we do appreciate the feedback, and I'll be sure to share it with our team. For those with Comcast, while it can't tell you specific device usage, their mobile app called My Account displays the amount of data currently used on your network for that statement period. Jeff C. thanks for the response. RE: comcast - I'm currently trying to diagnose which of my devices is contributing to my usage. With data caps likely to only become more common, a really great feature would be for eero to tally the total and per device total and reset every month. Basically, I don't trust comcast and would like to have my own means of measuring my usage including attribution for my devices. The eero is the best place for this to live and seems like you guys are already on a path to do this. ascarter Allow users to set their billing start rather than just blindly using the 1st of the month. This is no more difficult to code. Also, set up configurable alerts if you are using more than X% of data in X% of time. I.e. let me say my billing period starts on the 19th and if by the 28th I've used more than 25% of my data, let me know via alert. ascarter and Jeff C. I second that! Magically in the same month that Comcast instituted a data cap and started charging for overages, they claim my household data literally DOUBLED. I have not been able to find devices using anywhere near the daily amounts they claim - and have done all the usual troubleshooting (new wifi passwords, malware scans, etc.). vonburkleo That sounds almost exactly like what I'm seeing as well. I instrumented all my Macs and none are anywhere near the total Comcast is claiming. Take your pick if it is incompetence or deliberate. Here's something I didn't realize. Comcast is measuring upload as well as download data against the cap. If you are big into cloud backups (photos, OS) that can easily consume a lot of data. It's really crazy to see an ISP put limits on routine consumer data usage (netflix, cloud backup). Time for FiOS. In the meantime, it's a new feature request for Eero: bandwidth monitor for upload and download traffic. I would love to see this happen! I would love to see it not only at the client level but the router level. See what clients are causing traffic and what internet is being used. I would also LOVE to see the connected speed of clients, and EERO to EERO speeds. Bandwidth would be a great feature for eero , Near the end of January I received numerous pop ups from Comcast waring me that I was nearing my data limit , I change my wifi credentials , plus my comcast username and , it did nothing , Cocast told me that consumed 50 gB on the morning I called them, between the hours of 12am to 7 am . Can someone recommend a app that can monitor the usage? How did you consume 50 GB of data in 7 hours? Jeff C. Great blog post. But haven't seen any of this in app. Would love to see individual device usage/bandwidth, aggregate usage, bandwidth between eeros. Yesterday we released app version 1.5.1 for iOS and Android. 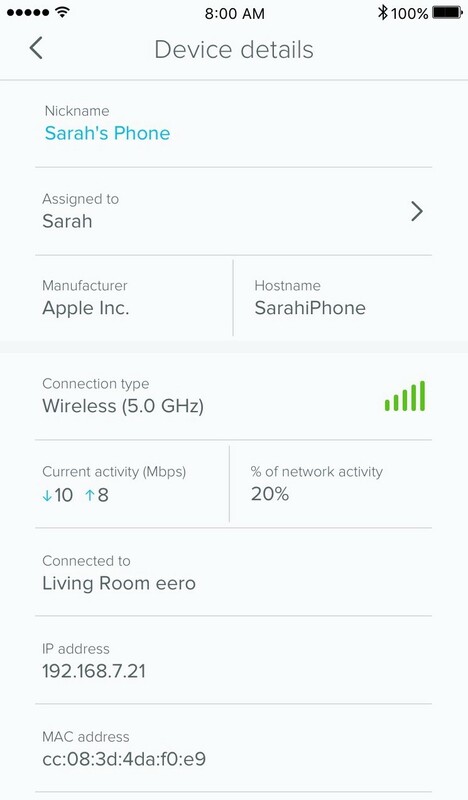 This new update brings the Current Activity feature to see how much bandwidth your devices are currently using. Happy to pass along the feedback for aggregate usage and bandwidth between eeros. I'd actually encourage creating a new feature request topic here for aggregate usage—that is different than other requests we've heard, so it would great to see the reception on that as a feature request of its own. Jeff C. Thanks Jeff. I updated to the latest app on iOS but don't see the real time activity. Does it work in bridge mode? griltech bandwidth usage is not available in bridge mode. Happy to share the feedback with our team. Jeff C. 1.5.1 showing current activity is great addition. I do have to wonder why all of my Nest 1080p cameras streaming to the cloud always show idle, and a Slingbox streaming on a LAN to an iPad are both idle. But I do see streaming activity to the same iPad using a different app, as well as activity on other devices, so there seems to be some selectivity in what the activity counter displays. Jeff C. This makes no sense. At least for the devices that are connected through the eero mesh, I don't understand why you wouldn't show activity. Seems like a huge miss. Same here. I'm watching my Samsung SmartCam cameras remotely that stream to the cloud. I'm viewing them in max resolution from work and I'm not seeing anything other than "idle" for the status. My NAS device also is syncing and streaming data to the internet and is showing "idle". I kicked off a speedtest from one of my systems remotely and it finally showed some traffic for that one. griltech The reason we don't report data usage for networks in bridge mode is because the traffic is coming into an upstream router versus the gateway eero. In bridge mode, while your eeros can still mesh, most advanced features are unavailable.